This is used alongside the pencil to remove layout lines. Pencil lines are useful to have when constructing the project but the eraser can then be used to remove them once the project has been assembled. 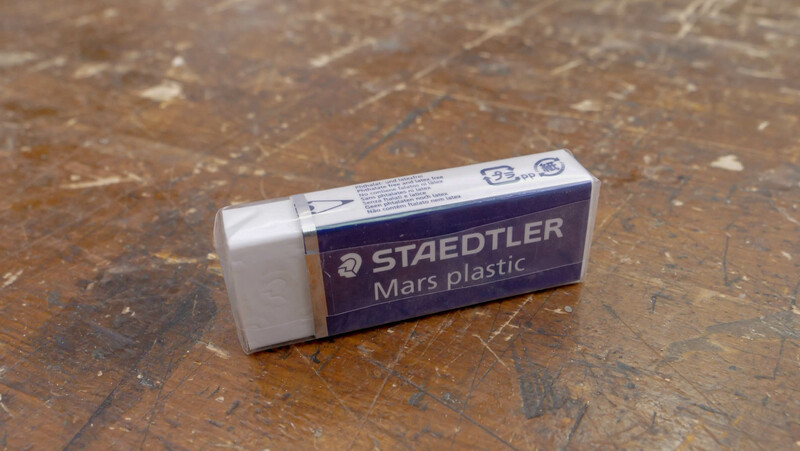 Paul likes the Staedtler eraser as it has no rubber in it. We purchased this from Amazon for £2.15*. This is used to mark out joints and sketch out designs. It is handy to have on the workbench for a quick way to make marks and layout lines. 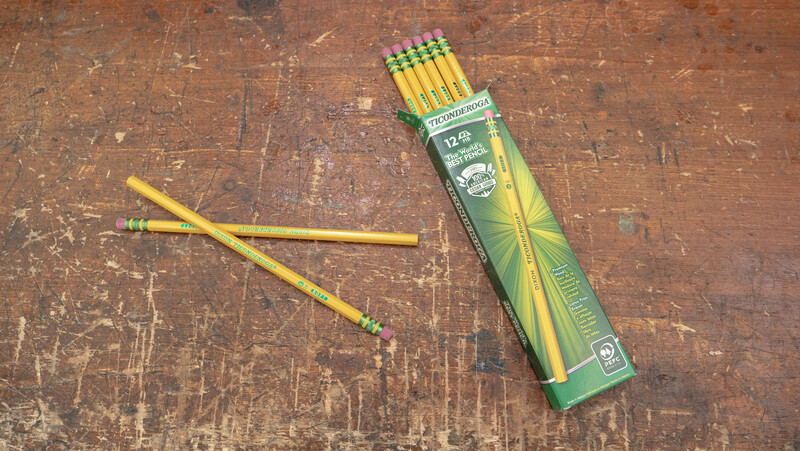 It is useful to have a pencil which can be used for sketching and also marking on wood, Paul recommends the HB/#2 Ticonderoga pencils as he found these are great for both jobs, they also have a handy eraser on the end. We purchased these from Amazon for £3.36* for a pack of 12. If you are ordering these from the US, we have found them on Amazon.com. 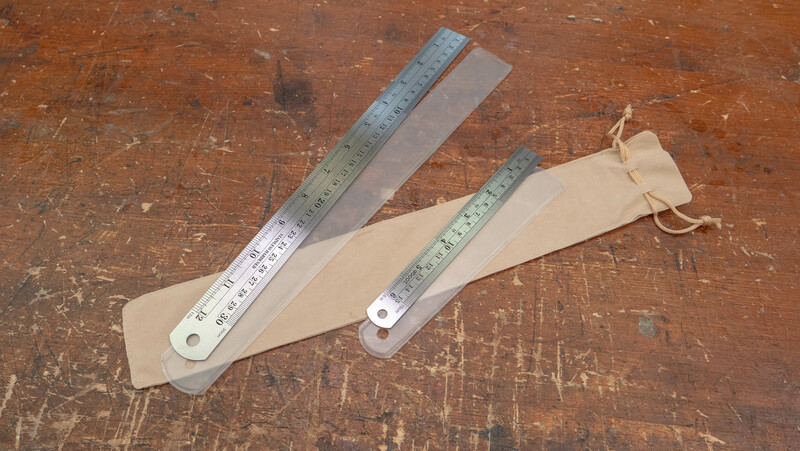 This is used for measuring lengths, this is preferred over a plastic ruler as plastic can become easily damaged when working with wood and tools. Usually comes in sizes of 12” (30cm) or 40” (1 metre). Paul recommends getting one which is engraved so the markings can’t rub away. We purchased these one from Amazon for £5.99.  If you are ordering from the US, we recommend this one from Amazon. Please note Paul has not purchased this, however it seems to fit his recommended criteria. A retractable tape measure allows you to measure long lengths without having to take up a lot of space for storage. 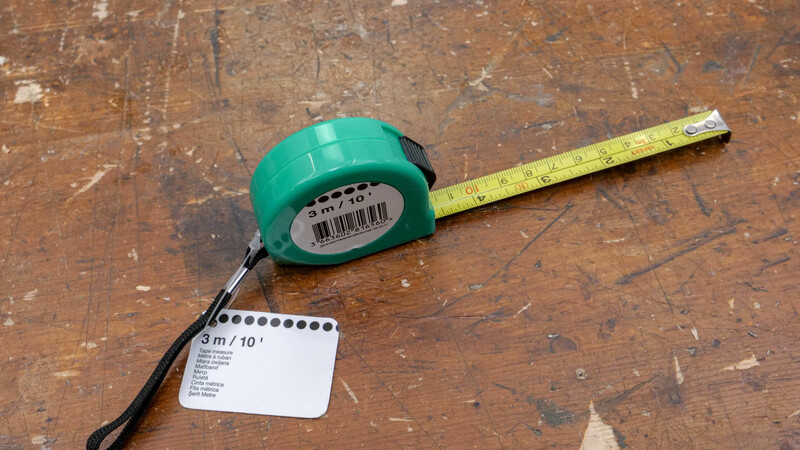 The curve in the tape provides strength and stiffness which provides a sturdy edge for marking. Paul recommends getting one with a plastic outer casing as this is lighter to carry around, he also suggests you get a small one which fits in your pocket. Usually the dimension of the casing are not stated online so it might be best to buy one of these in store. The flat head and cross head screwdriver are commonly found in most household tool boxes. They are a useful tool to own as they are compatible with many fixtures and fittings. 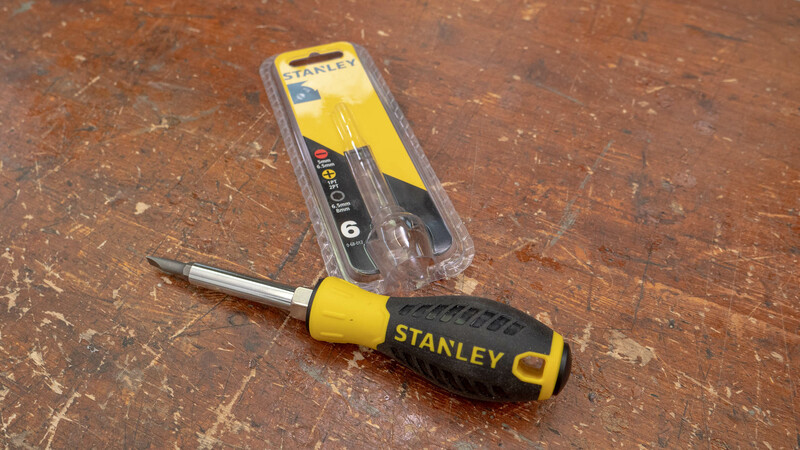 Like many hand tools, this tool relies on the strength of the user, for this reason, some people prefer screwdrivers with rubber grips as this gives more purchase when tightening/loosening however Paul prefers them without. The main use is to either tighten or loosen a slotted screw. These can be countersunk, raised or domed, as long as they have a slot for the screwdriver. Paul suggests getting a 4 in 1 screwdriver which has interchangeable heads as this saves space and money. We purchased this from Amazon for £4.45*. If you are ordering from the US, we have found it on Amazon.com. Head- The end of the screwdriver which comes into contact with screws and can come in a number of different shapes. There are several different types of awls which are for different crafts, some work better with fabrics, some with metals and some with woods. The square awl is most commonly used in woodcraft and is made up of a steel stem formed into a square cross section and held in a wooden or plastic handle. 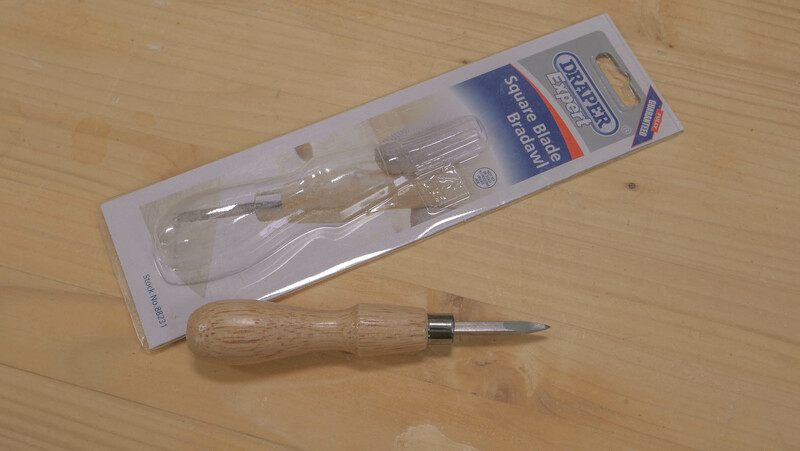 The main use of a square awl is to pierce the wood to start off a hole for a screw. By starting off the screw in this way, you are ensuring an easy and accurate start for the screw. Using an awl can also reduce the risk of the wood splitting when the screw enters. To use, hold the handle and press the point into the wood, turn both clockwise and anticlockwise by ¼ turns until the point has reached the required depth. This parts the wood fibres without actually removing them. The tapering end of the awl has corners which act as cutting edges, they do need sharpening over time, this can be done by filing the flat faces with a file. You can buy a new square awl for between £6-8, Paul recommends buying the square awl. Marking Awl/ Scratch or Scratching Awl, Piercing Awl amongst others. We purchased this from Amazon for £8.26*. If you are ordering from the US, we recommend this one from eBay. Please note Paul has not purchased this, however it seems to fit his recommended criteria. As always, Paul’s Guides are spot on. I have really changed a lot of my woodworking habits since I stumbled onto Pauls WebSite. Thanks, so much for all the good advice. 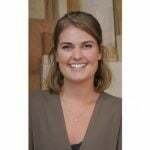 It’s great to hear you are finding the guides useful! Would be great if you could put a link to the next guide at the bottom/top of the page just to make navigation easier; otherwise good info especially if you are just starting on this journey. May Paul suggest a protractor? Thank you. Paul says protractors are handy to have but he doesn’t consider them essential at this stage.